In the wake of extreme weather events, people often ask scientists if they can be linked to climate change. Naturally, questions are being asked about tornadoes following the tragic losses suffered in the region of Moore, Oklahoma on May 20, 2013 after an EF5 Tornado. This historic force of nature was met by heroic stories of lives saved through quick actions by teachers and neighbors to help others seek shelter, which are important to be told in the immediate wake of tragedy. Nonetheless, questions are naturally being asked and stories told about this tornado and connections to climate change. The short answer is that scientists don’t see a clear link between climate change and the number or intensity of tornadoes over the past several decades. The Intergovernmental Panel on Climate Change special report on extreme events expressed “low confidence,” mainly due to inadequacies in monitoring systems. I created this image to help dispel some myths in the news lately. Statement based on data from NOAA (see figure below). Photo from NOAA’s National Severe Storms Laboratory. While a warmer planet could theoretically affect tornadoes, such as warmer and moister atmosphere, jet stream location changes, and equator to polar temperature gradient changes, we just don’t yet have enough data over the long-term to draw firm conclusions. Tornadoes are rare, short-lived, and difficult to measure, and the record also has to account for a change in the tornado classification system. By contrast, scientists have many ways to measure and model heat waves, coastal flooding, and changes to precipitation patterns — and consequently have been able to draw definitive links between those phenomena and climate change. Thankfully, collecting more data on tornadoes has many benefits, especially for people who live in areas at risk for them. In fact, people can report tornadoes directly to NOAA’s National Severe Storms Laboratory and University of Oklahoma through a smartphone once they are safely sheltered. Our understanding of how a warmer planet affects storms that spawn tornadoes, as well as wind patterns, suggests more atmospheric energy could be available for tornado systems. On the other hand, tornadoes are difficult to model since specifics for individual tornado formation are still an area of active scientific research. Furthermore, tornadoes are tiny compared to the average grid spacing in most climate models. Based on the data we have to date, there are no clear trends for tornado frequency or intensity. Tornado damage estimates depend in part on how many people and how much property is in its way. The number of severe U.S. tornadoes EF3 or greater (those with gusts of greater than 136 miles per hour), has not changed much between 1954 and 2012. The most severe tornadoes, rated on damage, typically occur in KS, AR, TX, OK, TN and MO. As more people occupy areas affected by tornadoes, we have more potential damage, but we also have more eyes watching the sky and more ways to report and track tornadoes, resulting in more data than ever before. Update May 24, 2013 in response to comment: Below is the figure for the annual count of US tornadoes EF1 or greater recorded in the US. It is somewhat dated, but there was a really good article in Physics Today, March 2012, on this topic called Predicting and Managing Extreme Weather Events, which talks about the NOAA’s research on unusual weather and climate patterns. Its very informative about the scientific aspects of our current situation and the need for greater public understanding. There is very little doubt about it. 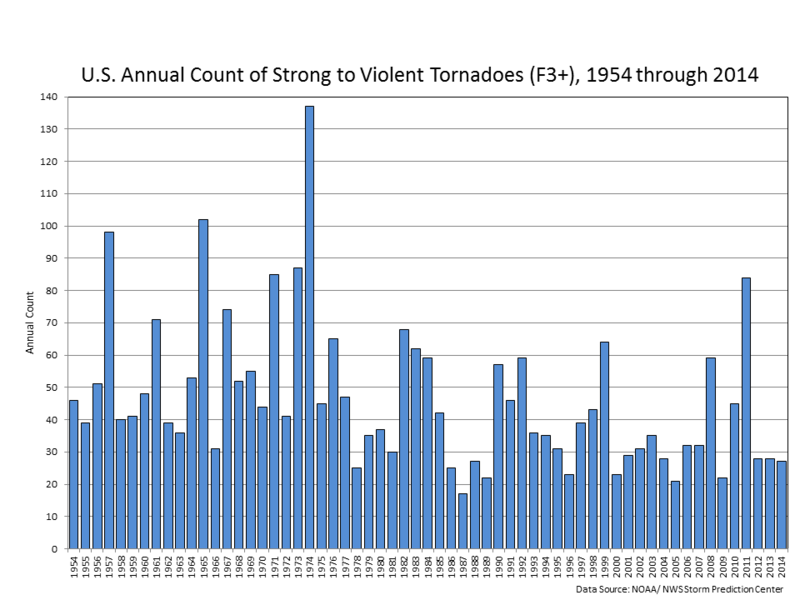 Observed Tornados have been increasing in the “Lower 48” States since 1950. Some, but certainly not all, of this increase is due to better observation and record keeping. Let’s be scientists, and leave the obvious cherry picking of data to the other side, OK.
Roger, thank you for suggesting we look at the full spectrum of tornado counts. I added the figure for the annual count of US tornadoes of EF1 or greater to update the post. SO, VERY VERY CLEARLY, OBSERVED TORNADOES ARE INCREASING, NOT DECREASING. Science has never said in 28 years and to this day still refuses to say that their climate crisis from Human CO2 is as certain and as real and as eventual as inevitable as they themselves like to say comet hits are. So there you have it folks; Science believes a climate crisis is not as real as they can say a comet hit is. Get up to date: *Occupywallstreet now does not even mention CO2 in its list of demands because of the bank-funded and corporate run carbon trading stock markets ruled by politicians. Tornadoes are similar to the geologic hazard of earthquakes in that we do not have long lead times to predict when and where they occur. So in many earthquake-prone regions, building codes exist to encourage engineers to design buildings to better withstand the shakes and rolls of the ground in order to save lives. Tornado shelters in historically prone regions can also help save lives as extra minutes are added to warning systems with better monitoring. Evidence is mounting with climate change that has already occurred, that more extreme events such as heat waves, coastal flooding, extreme precipitation and drought are testing the resilience of communities designed for the climate of the past. As Dr. Sullivan, Acting Under Secretary of Commerce for Oceans and Atmosphere and Acting NOAA Administrator said yesterday during a White House Summit (http://1.usa.gov/16f3iFt) “Past is not prologue” when it comes to planning for future risks associated with climate change.